Keane Webre-Hayes was seriously injured in the attack. 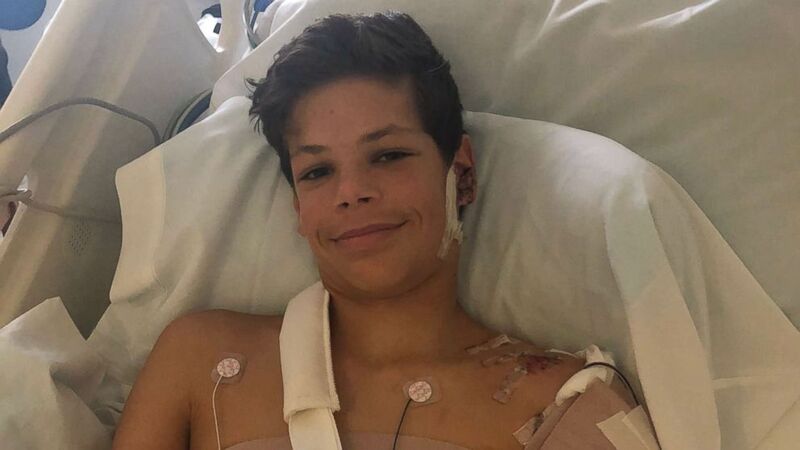 Keane Webre-Hayes is still laid up in a hospital bed two days after he was attacked by a shark off a San Diego beach, but he's already making plans to get back in the ocean. Hayes' mother, Ellie, spoke at a press conference on Monday evening and said her son is slowly recovering from serious bite wounds to his upper back, left arm and shoulder and left side of his face. "Today someone brought him a mask and a snorkel, and he feels pretty determined in this moment he is going to get back out there," Ellie Hayes said. "He said, 'Mom the chances are so much more slim for a second bite.'" (AP) Ellie Hayes, the mother of Keane Webre-Hayes, reacts as she speaks about her son's recovery, alongside her husband, Ben, right, at a hospital Monday, Oct. 1, 2018, in San Diego. Webre-Hayes was expected to recover after a shark attacked him while he dived for lobsters in Southern California. The 13-year-old was swimming at Beacon’s Beach and looking for lobsters in Leucadia, California, just north of San Diego, when he was attacked by the shark, authorities said. 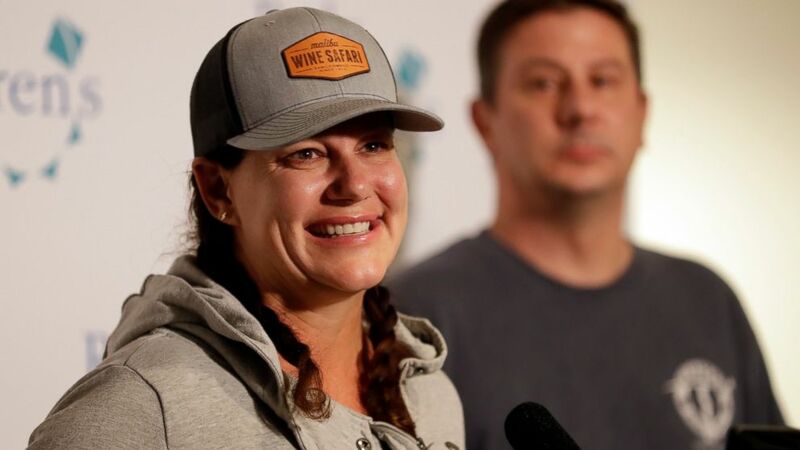 Webre-Hayes, who was in water about 9 feet deep, was rushed to shore by lifeguards and good Samaritans and eventually airlifted to Rady Children's Hospital in San Diego, where his mother spoke Monday. "We got blessed on Sunday -- we got very, very lucky. We know it and we are thankful," Ellie said. "Keane is really special. ... He is very brave, very strong, athletic. I don’t know. He’s a warrior; I didn’t know he was that good of a swimmer, so I'm really proud of him." Keane was listed in critical condition Sunday and underwent immediate surgery after arriving by helicopter at the hospital. Dr. Tim Fairbanks, the hospital's chief of pediatric surgery, said Monday he's been upgraded to serious condition. "It has been an honor to take care of Keane and his family during this time, and I also want to let you know our work is not done yet," Fairbanks said. "We are thrilled to be where we are right now, but we still got to get him across the finish line, and get him all the way better." Doctors shared a photo of a smiling Keane in his hospital bed, with his left shoulder and left side of his face showing the fresh wounds caused by the shark's bite. (Provided) Keane Webre-Hayes, 13, is pictured in his hospital bed at Raby's Childrens Hospital in San Diego after surviving a shark attack on Sunday, Sept. 30, 2018. His mother thanked three men who were in a kayak nearby when her son was attacked and helped to get him to shore. "Thank you so much," she offered the good Samaritans. "Keane has been asking for them. I just want to say 'thank you' to all three of them. Without what they did, we would be having a whole different scenario. Keane has been asking for them and just real quick his eyes haven’t welled up until he asked for the people who saved his life." The family said they did not want to discuss the full extent of Keane's injuries, but they do expect him to make a good recovery, even if the scars will remain. Doctors emphasized that Keane said he was thankful all of his limbs were in tact. "I am going to honor their wishes ... what we will and wont go over; it was a very large shark bite, very deep down through the chest through the muscles," Fairbanks said. "We’re not going to go into much more details than that. It was a very large injury." "I think it is a miracle, I think Keane is a miracle," his mother said. ABC News' Jim Vojtech and Kevin Lo contributed to this report.